Michigan students and farmers are benefiting from the new 10 Cents a Meal for School Kids and Farms initiative. Created by the Groundwork Center for Resilient Communities, the program creates a matching fund so schools and farmers can work together to put fresh, local fruits and vegetables on students’ plates. Schools in 16 northwest lower and west Michigan districts will receive up to 10 cents per meal to purchase and serve locally grown fruits and vegetables. 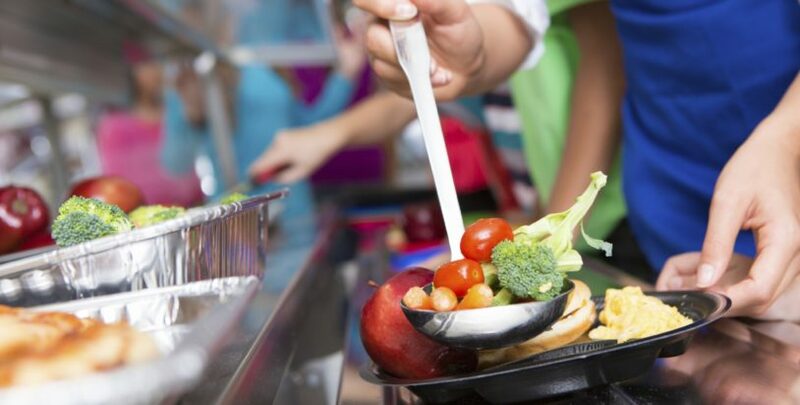 The program is expected to put healthy, Michigan produce on the plates of an estimated 43,000 students during breakfast, lunch, dinner and snacks, according to Jacob Wheeler, Groundwork Center’s communications manager. The 16 districts, selected through a competitive grant, served 3.8 million meals last year, many of them in schools where 50 percent or more of students come from financially struggling families who rely on school meals for important daily nutrition for their kids. The 16 school districts are: Boyne Falls Public, Frankfort-Elberta Area, Glen Lake Community, Leland Public, Manistee Area Public, Northport Public and Traverse City Area Public schools in northwest lower Michigan; and Coopersville Area Public, Forest Hills Public, Grand Haven Area Public, Montague Area Public, Muskegon Heights Public School Academy System, Muskegon Public, Oakridge Public, Ravenna Public and Whitehall District schools in west Michigan. The ultimate goal of 10 Cents a Meal is to see local produce in every cafeteria in Michigan. Learn more about the 10 Cents a Meal program in this video created by MyNorth Media.